Most dentists use implants to retain a full denture if not enough implants can be placed to create a full arch of fixed bridge work. However, osseointegrated implants are quite strong and have been used successfully to support precision attachment cases for over 14 years. Because precision attachment cases work so well on the weakest teeth imaginable, they work exceedingly well on implants, which are usually strong. Superior Comfort and Self-Esteem. The posterior bar can be made thin and only covers a small area of the palate, while a denture usually covers the entire palate. The patient wearing an attachment case has anterior (front) teeth that do not come out, unlike the patient wearing a denture. He or she doesn’t feel bad looking in the mirror when removing a partial denture for hygiene. Superior Function. Unlike a denture, the posterior bar of an attachment case frees the tongue for normal speech and allows taste buds on the anterior palate to function normally. 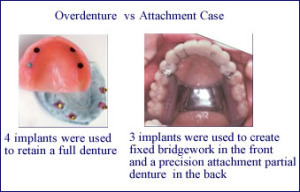 An attachment case doesn’t have the anterior-posterior movement that an implant supported denture might have. Patients with an attachment case on implants can bite into anything. This may not be possible with any type of denture. Increased Longevity. A precision attachment case does not place lateral forces on implants, which can be destructive to implants as well as natural teeth. Implants are not indestructible and if overloaded they can fail. A denture connected to implants, however, is usually locked in place. Patients Avoid Wearing Dentures. A denture that rests on tissue can only exert 10 to 15% of the force of a patient with natural teeth6. Although the placement of implants may making wearing a denture easier, most people don’t want to go through the surgery and expense unless they are going to get rid of the denture. Patients who wore an attachment case prior to wearing a denture know the difference between the two, and they are thrilled that they can have the same exact case on implants. Both Natural and Implant Abutments Can Be Used. Single posterior teeth that remain from a previous attachment case can be left intact, and used as part of the new attachment case! Unlike fixed bridgework, a precision attachment partial denture can link both implant and natural abutments because of the stress-breaking action of the attachment case. Anatomical Problems: Most of the anatomical problems encountered for placing implants are in the posterior regions of the mouth. Inadequate bone under the sinus (upper arch) or above the mandibular nerve (lower arch) may make it impossible to place implants of adequate length to support fixed bridgework. Bone Grafts: The prognosis for success is lower when bone grafts are required for implant placement and the duration of treatment is much longer. Candidates for these procedures are patients who understand the risks and accept them in order to have fixed bridgework. Fixed Bridgework with Cantilevers may be inappropriate. Branemark’s studies have proven that four or five implants in the anterior region can be used with cantilevers (unsupported teeth added) to create a successful case. Dr. Per-Ingvar Branemark discovered osseointegration and conducted 30 years of scientific studies with implants before implants came to the United States in the early 1980’s. The studies were all fixed bridgework cases: implants in the front of the arch and bicuspid cantilevers for the back of the arch (extensions from the front without implant support). Anatomical deficiencies prevent the placement of sufficient implants to support fixed bridgework. Bicuspid occlusion is inadequate for neuromuscular comfort, esthetics, or function. The patient has been comfortable with an attachment case in the past. The patient does not want too many implants placed. Patients who do not want the extra surgery and expense of multiple implants are very receptive to the placement of only three implants to restore an entire arch. 5. Patients Choose Implants to Avoid Wearing Dentures. Implants can usually be placed in the upper and lower anterior regions of the dental arches. The placement of just three implants is enough to make a fantastic attachment case—an anterior fixed bridge and a precision attachment posterior partial denture. Lower Precision Attachment Case with 3 Implants: The worst restoration in dentistry is the lower denture. With only three implants, this patient has a fixed bridge in the front that enables her to bite into anything. The precision attachment partial denture is worn 24 hours a day and only removed for hygiene. This case was completed in 1993. Few changes have occurred in the X-Rays during a 14 year period. Aside from regular hygiene visits, the patient has had only routine maintenance on the partial denture.